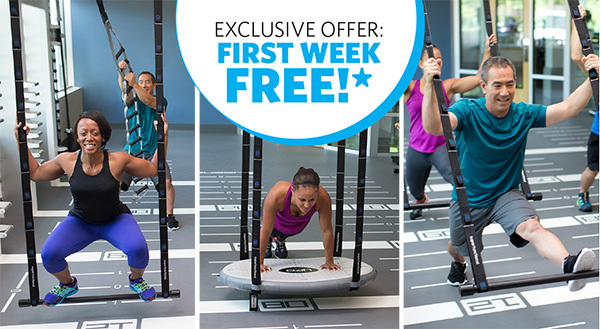 Welcome to our fitness playground—Small Group Training (SGT) on the Precor® Queenax™. It’s full-body training unlike any other—led by a Professional Fitness Trainer—with an emphasis on improving your functional movement. SGT will challenge, motivate and elevate you to a new level of fitness. One of the most effective and efficient ways to lose inches and body fat, this self-paced circuit workout is a dynamic blend of resistance training and sustained cardio training. A satisfying full-body workout for all fitness levels. At the center of a healthy body is a solid core. Engaging the core muscles through suspension exercises, this training builds strength, coordination and flexibility. Fire up your metabolism! Get lean and strong with this full-body workout that targets arms, core and lower body through strength and conditioning exercises. Maximize your calorie burn and cardiovascular fitness in this high-energy, high-intensity training that targets all the major muscle groups. Wake up your body with this fast-paced circuit workout using the Queenax™ Superfunctional™ equipment. All major movement types—push/pull, squat/lunge, core/hips, twist—are incorporated for a stronger, more stable body. Through suspension training this class targets your core, strength, power and metabolic conditioning for an effective and efficient workout. High-intensity training combined with active recovery—that’s Power Morning. This class supercharges your metabolism, challenges your muscles, builds your stamina and ends with recovery techniques to repair and rebuild your muscles. muscles and increasing your cardiovascular endurance. A challenge for the body unlike any other. Improve endurance, strength, stability and flexibility using the Queenax™ Superfunctional™ trapeze system. Select an SGT class and make it part of your regular exercise program—eight classes per month (two classes/week). Or join Power Morning on Fridays only. Your monthly SGT fee will be included on your membership statement. To change classes or cancel, a 30-day cancellation notice is required. Get in an SGT workout without the commitment. Register for one class at a time and try out the classes that interest you most. Register online or on the CFC Member App. A daily schedule of classes is available in the “Classes” section.